TimAdd Newe to get the bike out, along with Scruffy’s trailer, for the annual Bike Around Athena. 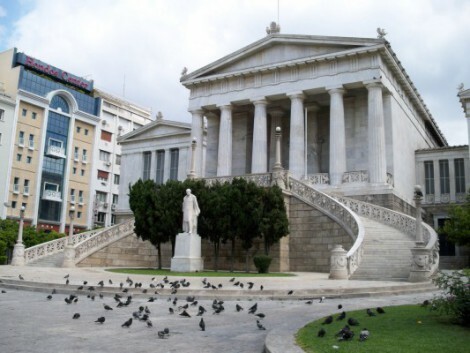 This year the ride starts at the Old Olympic Stadium (Panathainiko Stadio) and there’s two routes to follow – a “difficult” route of 8 km (LOL) and a kid friendly route from Syntagma Square to Kalimarmaro Stadium. Remember that this isn’t a “race” but rather a time for the city streets to be emptied of cars and other motorized traffic so that cyclists of all ages and sizes can enjoy the city center – but more important to also demonstrate that bicycles are a wise alternative for getting around the city center. Each year that participation grows in this Bike Around Athena event is another year that brings Athens a tiny bit closer to becoming bike friendly. 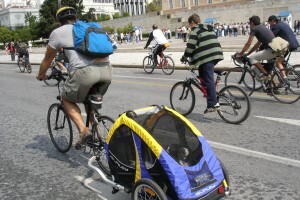 If you’re visiting Athens on October and want to ride, it is a good idea to contact a bike rental agency as soon as possible because rentals are limited and they always run out of bikes on the day of the Bike Around Athens event. Acropolis Bikes, located right downtown, rents bikes by the hour, the half day and the full day. 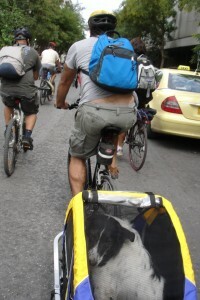 If by chance you miss this event, they also offer organized bike tours of the historical center. Visit them online at www.acropolisbikes.gr. OK, so it wasn’t the “tour de France” or Olympic moment I envisioned, speeding past the Parliamant Building like those cyclists on the postcards from the Olympics trials… but it sure was fun having no cars on Vas. Sophias!